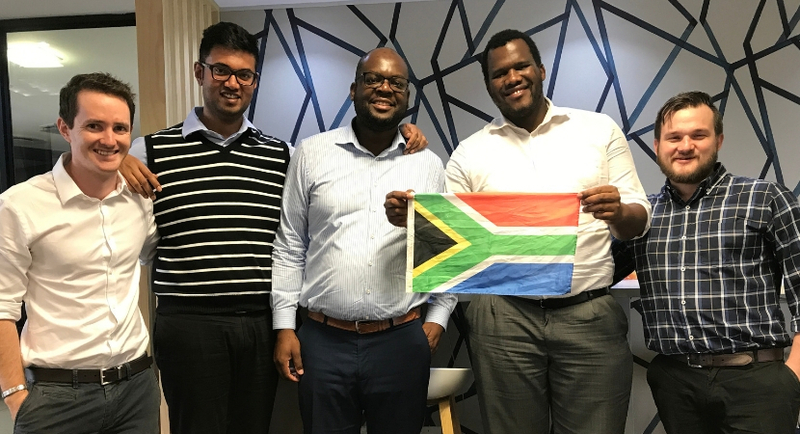 Joining me now on the podcast are Shane Curran and Ignatius Nkwinika, who are the founders of InvestSure, which has just secured R9.6m in its first-ever funding round. So, Shane, for those who don’t know about InvestSure can you remind us why it’s a world’s first? Sure, so it’s the first insurance product that protects shareholders against losses in a share price caused by allegations of management committing fraud, and fraud is quite broadly defined to be misleading shareholders, accounting scandals. It includes bribery and corruption allegations. There have been quite a few stocks that would have been weighed down by the risks that you talk about. I can think of the likes of EOH as probably the most recent example this year. But can you give us some examples over the last year that have stood out in your mind, where your customers have been safeguarded from risks in the market? [Shane] Yes, 100% so, EOH was definitely the biggest one in the last year and I think in one of the claims, one of our customers would have lost just over 50% but because he had InvestSure he basically lost nothing. So, that was quite a cool one for us. The other ones that we had during the year were the Resilience stable again, as well as MTN. MTN I think, triggered twice during the last year and that was to do with the Nigerian Government deciding that they were repatriating funds incorrectly and they owed $8bn, and the share price took quite a hit. I think they eventually settled for a very small amount but the fact of the matter is because of the allegation the share price lost a lot more than the final outcome so the product, again there, for the MTN example was very valuable for our customers. Can you guys give us some ideas of when you would trigger-off your service? Do you have a set group of tick boxes that you have to go through before you can start to help investors who have been hit by these very dramatic and negative slides? [Ignatius] Yes, so normally Shane and Mbulelo Mpofana [InvestSure co-founder] would be watching the news as well as the share prices. We have a system called ‘The News Board’ where they actually put these events and then we track the share prices from there. So, once the share price drops below a certain threshold a claim event is raised on our side and we notify the clients of such a claim. [Shane] Yes, and if the client sells their shares at any point in the next 30-days below that threshold, which is 10% from the price the day before the news, we basically make up that difference – what the price was versus what they sold at. So, regardless of what the price does in the next 30-days (if it goes down) we ensure that they’re covered for the price before the news. How many customers have you got, to date? Are you able to give us any ideas around numbers? [Shane] We have about just over 3.5k sales. There are about 700 customers. Often, they buy multiple times. We see quite a lot of repeat purchases so, once someone has bought the product, they buy it on a lot of their recurring purchases. Let’s talk about this funding round that you’ve raised as well. I find it interesting that it’s your first funding round. It’s R9.6m that you’ve raised. Can you tell us what the money will be used for? [Shane] Yes, we’re with EasyEquities at the moment, and now, it’s time to move the product onto other platforms as well. Basically, the money has been earmarked to do that development with other platforms, as well as to strengthen our presence on the existing platform. So, on platforms like EasyEquities. Can you tell us more about the funders behind this R9.6m round and why they invested in you? [Shane] I think the first one, let’s speak about Compass Insure — so, they are actually the risk carrier behind the product. It’s an insurance product, so you need insurance capital behind it and that’s Compass Insure. So, they incubated our company and we sat side-by-side with them for the last two years while we developed the product, launched the product and we have a very good relationship with them and they decided that they’d like to invest in the company – they like what they’ve been seeing and they’ve invested directly. Then Lireas Holdings are a private equity company that are part of the same group as Compass. We also have a very close relationship with them and they’ve been watching us for quite a while and the idea was always that once we have some traction in the market, they would at making investments. Then the third player is 4DI, and they are a traditional venture capital firm. I think they just liked what they saw and they invest in early-stage businesses that are highly scalable. We met them, we like them a let and they have a lot of experience in basically the VC space. I think they’re on their second fund, it’s about over 10-years of doing these kinds of investments and they bring a lot to the table. They have a few companies that they’ve taken global. So, I think they’ll be a very good partner for us as well. Could this be the first of many funding rounds, I presume, in months and years to come? [Shane] We’d like to limit funding rounds and try and live off free cash flow now as much as possible. But we will definitely need another funding round probably in the next 18-months. We will definitely have another one but we don’t want to have too many. We see a lot of the start-ups that raise capital like once a year and we don’t want to do that. We want to try and get the business to stand-alone. We don’t have high costs like a traditional start-up so, we don’t burn cash as quickly as others. Just in terms of your partnership with EasyEquities. How has that faired? It’s obviously a very big platform that they’ve got and they’re part of the Purple Group as well. It’s a very interesting partnership that, isn’t it? [Shane] We’ve really enjoyed working with them. They have a lot of clients and I think they’re really pushing the drive in SA to move investors to become retail investors, and to do it yourself. There’re all the tools you need out there and they’ve made it affordable to do it. So, it’s been really cool working with them and just seeing how they go about their marketing and attracting clients. We’ve seen they have a really very engaged userbase so, it’s been very cool to launch with them. We’ve learnt a lot from them. Are you still very much focused on the SA market or are you looking to expand elsewhere as well? [Shane] We want to expand first in SA but EasyEquities is a perfect example. You would have read that are hoping to launch in Australia about mid-year. So, we are trying to go with them into the Australian market. We’re not focusing on the Australian market but we’re on the EasyEquities platform and it’s quite easy for us to just go with them. In that sense, we are expanding internationally but we’re focussing on getting onto more of the SA platform so, we’re talking about two or three at the moment that we should be onto. Where do you see things panning out in the local market in the next 18-months or so? [Shane] Just adding it onto more platforms and getting more awareness of the product. We have seen a lot more awareness recently. When we used to go and speak to people we had to explain the product and people would be like, ‘yes, we know you, we’ve been watching you guys.’ We’ve just started research on the Australian market and we haven’t seen as many events as the SA market, especially in the last three years. So, I think the SA market will continue to be very relevant to the product and a very good buy for people that invest directly in companies. It’s a very interesting point that because I guess that at the JSE – there’s been quite a few explosive stories over the last few years, which probably makes this market unique in that way, right? [Shane] Yes, the other market where I see something similar is maybe the US, but we’re not looking at going into that market at the moment. But the JSE has definitely [had a lot of events]… When these allegations come out people react quite intensely and I think that’s a SA cultural thing probably, where generally when we do react, we react quite strongly. Shane and Ignatius, thanks for joining me on the podcast. [Ignatius] It’s been a pleasure.